Grown from seed with love. Is there anything more inspiring than the magic that sprouts from the tiniest of seeds? We don't think so. Our floral design studio and flower farm are committed to sustainable and responsible practices. 80% of US flowers are imported from other countries - many that allow the use of pesticides and carcinogens that are banned in this country - and have poor standards and pay for their growers. Our little farm is just one drop in the bucket of the growing "slow flowers" movement in the US. We realized quickly after deciding to move away from northern New Hampshire that we'd miss a cut flower farm that we'd grown to love as customers. It was then that we decided to take things into our own hands and to try growing the blooms we loved on our own small farm to feed a new floral design business. That initial decision has taken us on a beautiful flower-filled journey. We never could have predicted how much more we'd connect as a family and learn to appreciate every little wonder of nature. My daughter and I started with just a few packets of seeds- some zinnias from my sister, Chantilly snapdragons, and Iceland poppies. See what's happening on the farm now. Follow us on Instagram @littlefarmhouseflowers or find us on Facebook. 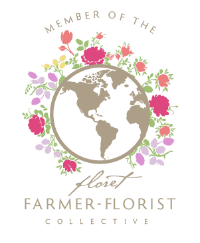 Little Farmhouse Flowers is a member of the Association of Specialty Cut Flower Growers, the Floret Farmer-Florist Collective, and the Women Who Farm Farm Finder.